Two years into a recession, the words "cash-strapped" and "states" or "cities" are practically wedded, and not in bliss. Nevertheless, I was stopped short the other day when I read that the entire Seattle public library system was being shut down for a week to save money. The closure includes not only the central library, a Rem Koolhaas-designed building touted as a model of the 21st century library, but also all branches, all services and the Web site. "All Library locations will be closed Monday, Aug. 31 through Sunday, Sept. 6 due to citywide budget cuts. Please note: Monday, Sept. 7 is the Labor Day holiday. ... Regular Library operations will resume Tuesday, Sept. 8. No Library services will be available during the one-week closure. ... The system-wide closure, along with other cuts, will help the Library meet a 2% budget reduction--about $1 million. The closure will save approximately $655,000." The online catalog was simply gone: Maintaining it was deemed too costly. Do these times really call for such a drastic measure? It's true that all over the country government services, even police forces and fire departments, are enduring cuts. Libraries cannot be exempt. But it's also true that, across the country, library usage is up, as it usually is during a recession. People use libraries not just to borrow books, but also to research and apply for jobs, use onsite computers, find wireless access, read newspapers and magazines, tap into expensive databases, access archives and scholarly resources, take classes, attend career and entrepreneurship seminars, get free entertainment, on and on. According to the American Library Association, 68% of Americans own a library card--an all-time high--and 76% of Americans visited their local public library in the past year, vs. 65.7% two years ago. Libraries have become an essential service, one that on average--per ALA President Jim Rettig--costs American taxpayers about $31 a year. So, back in Seattle, rather than close for a week, why not implement a series of rolling closures? Apparently, the Seattle Library considered that, and decided against it. In a document posted online, City Librarian Susan Hildreth stated that "other options--such as a rotating schedule of closures so that some Library service was available--were examined, but did not produce the magnitude of savings necessary." That doesn't compute: There simply has to be a way to achieve an equal amount of savings. Nor does the reason offered by the Seattle Times editorial page wash: "Closing libraries at varying times was attempted in response to earlier budget cuts. That approach proved disruptive. Patrons were less riled by the closure and more annoyed by the confusion of figuring out which libraries were open when," it wrote. "The closure results in less inconvenience because it occurs all at once and at the lowest usage time of the year." Perhaps. But maybe people didn't know which libraries were open because the closures were not communicated well. Even this year, though the week-long closure was announced last April, "a steady stream of would-be patrons still tried the doors or the locked depository bins on Monday," the Times reported. People must still be confused, not to mention annoyed. The questions must be asked: Is it simply easier to close for a week, than to orchestrate more complex rolling closures? Is it simply more convenient for staff? Can you imagine a critical service business shutting for eight days without losing customers? Only a "monopoly" like a city library would try that. The American Library Association has been urging U.S. libraries to make the case that, especially in these tough times, libraries are part of the economic solution, not part of the problem. 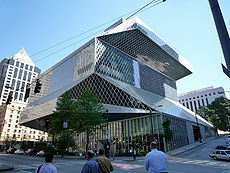 The Seattle Library's decision to close the entire system, at once, severely undercuts that case--even more so because it is seen as a model for the 21st century. Worse, it's already talking about another system-wide closure next August--along with, probably, reduced hours in general. What kind of a model is Seattle providing?